Kyle Perkovich receives the $10,000 Leading Horse and Rider Bonus from Pat Boyle. Photo Chicago Equestrian. 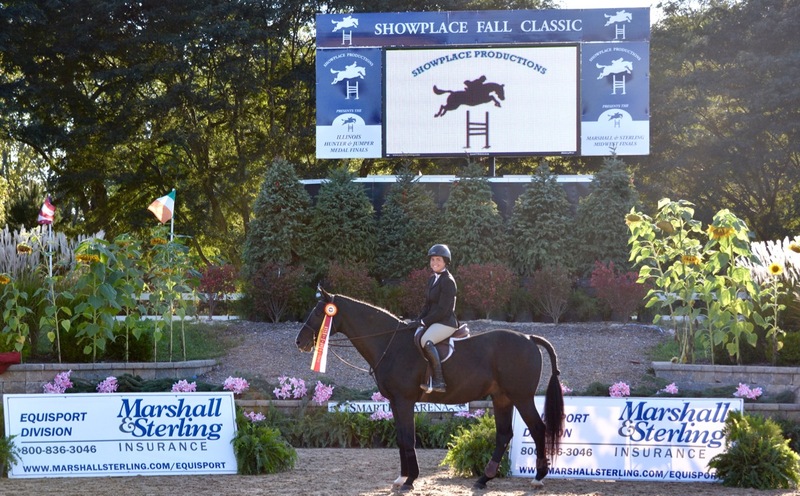 Wayne, IL – September 18, 2016 – Showplace Productions hosted the Midwest Marshall & Sterling (M&S) Championships at Lamplight Equestrian Center in usual Showplace style. Show Manager Patrick Boyle had everything perfect in the Grand Prix ring including great courses, beautiful jumps, amazing awards, fantastic VIP seating with top notch hospitality and perfect weather to boot. Marshall & Sterling Insurance, Equisport Division, sponsors the Medal Finals. The first class of the day was the $5,000 M&S Children’s Adult Jumper Championships. Over 30 entries vied for the tri-color ribbon as the class leader changed hands several times. Amateur rider Molly Struve, 27, of Wilmette, Illinois, proved to be the fastest double clear round on Orchidee Milody, earning the Championship. Struve rides with Scott Gentry at HBG Equine in Bristol, Wisconsin. Struve and her Orchidee Milody were the 2014 USHJA North Region Adult Jumper Champions as well as part of the Zone 5 team bronze winners. The pair has won numerous other championships and jumper classics in their career. Grace Klein with Luminous finished in second, Elizabeth Lang and Sothis D Ouilly were third and Jean McLaren and Snow Day made the top four. 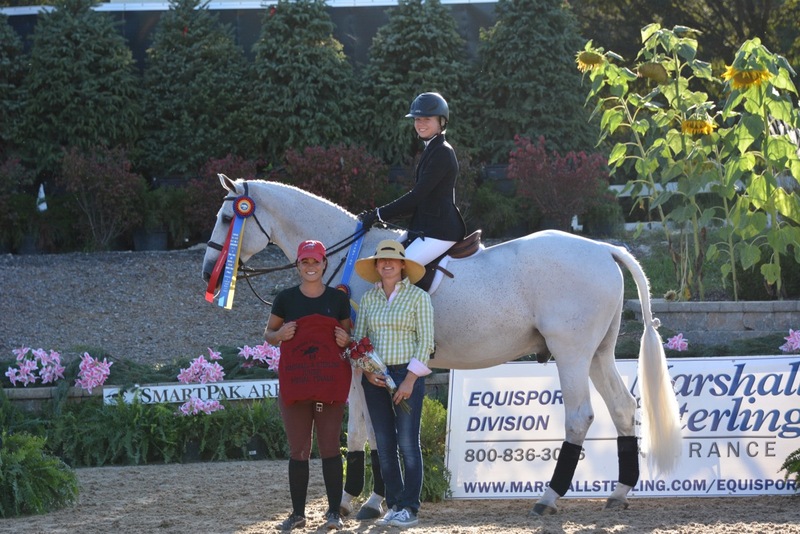 Next up was the $5,000 NAL/M&S Low Junior/Amateur Classic. The competition drew some of the areas best young riders; many of them also participated in the M&S 1.30m Grand Prix series. Faster and faster they went until Kyle Perkovich, 15, and Roc My World couldn’t be beat. He blazed around the track leaving out strides while leaving the jumps up for the win. Giavanna Rinaldi and Dominic DV, owned by Lisa Zinck, tried to catch them but landed in second with Rodrigo’s Bianca and Adeline Rohrback in third. Kyle Perkovich with trainer Lisa Goldman. Photo Chicago Equestrian. 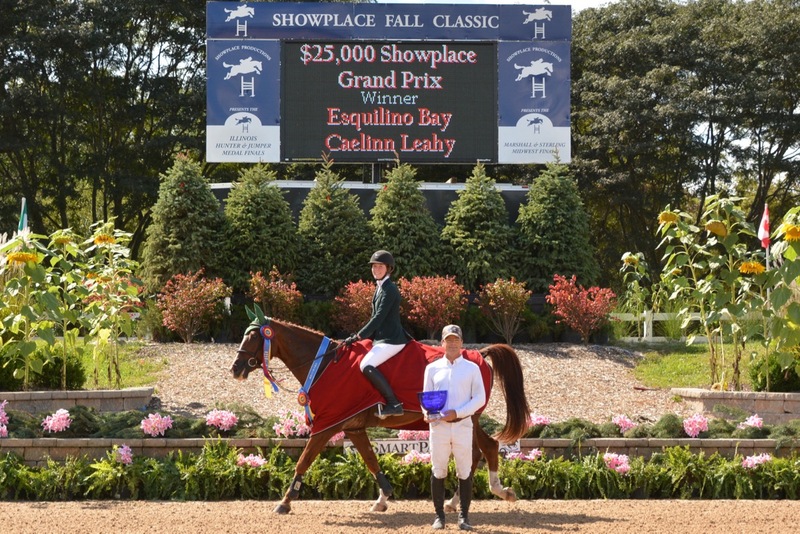 Among the many feature events of the day was the $25,000 Showplace Grand Prix. Nine riders out of a field of 22 made it around Anderson Lima’s course fault free to qualify for the jump off. Lisa Goldman and Sovereign were first to return and did not disappoint spectators, setting the pace for the rest of the field with a speedy, clear jump off in 35.731. Maggie Jayne and Amanda Dolinger’s Cupina Colada were the next to go clean but a slower time of 36.812. Four of the nine riders had a rail come down, including Goldman’s second ride on Centurion B, where she had a faster time of 35.549 but incurred the four faults. Caelinn Leahy and Esquilino Bay with trainer Steve Schaefer. Photo Chicago Equestrian. Caelinn Leahy, 14, showed them all how juniors do it, scorching the course in 34.020 on her Esquilino Bay for her first Grand Prix win, leaving Goldman and Sovereign in second and Jayne with Cupina Colada in third. Leahy also participated in several of the M&S 1.30m Grand Prixs this season. The series was very popular for young horses and younger riders moving up the divisions. 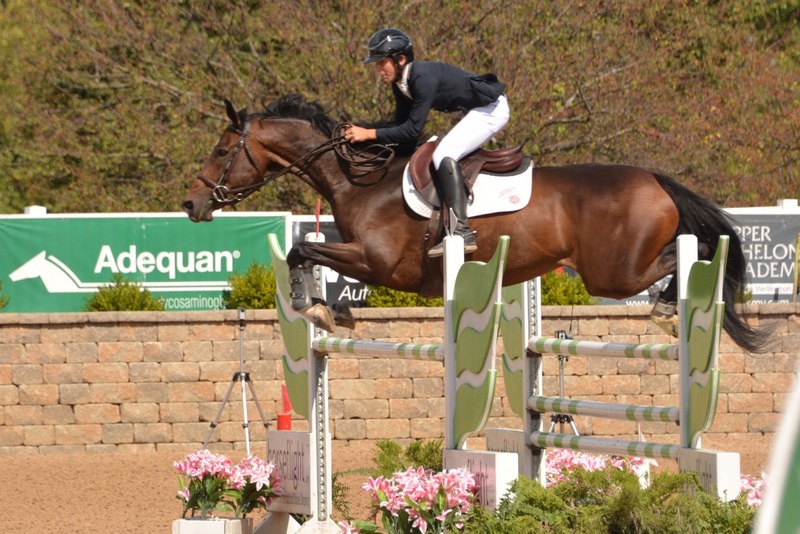 Leahy trains with Steve Schaefer at Bellis Show Jumping in Maple Park, Illinois. 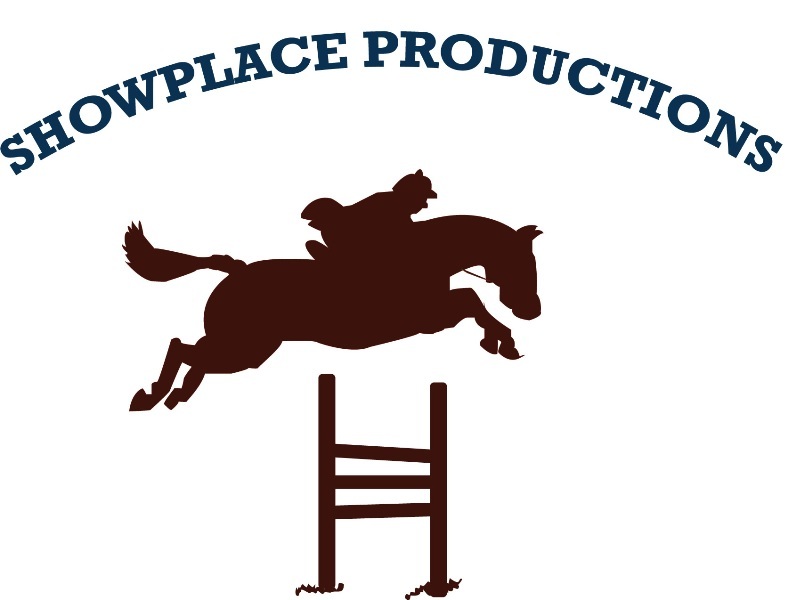 Showplace Productions awarded the $150,000 M&S 1.30m Grand Prix series awards to the highest scoring participants. 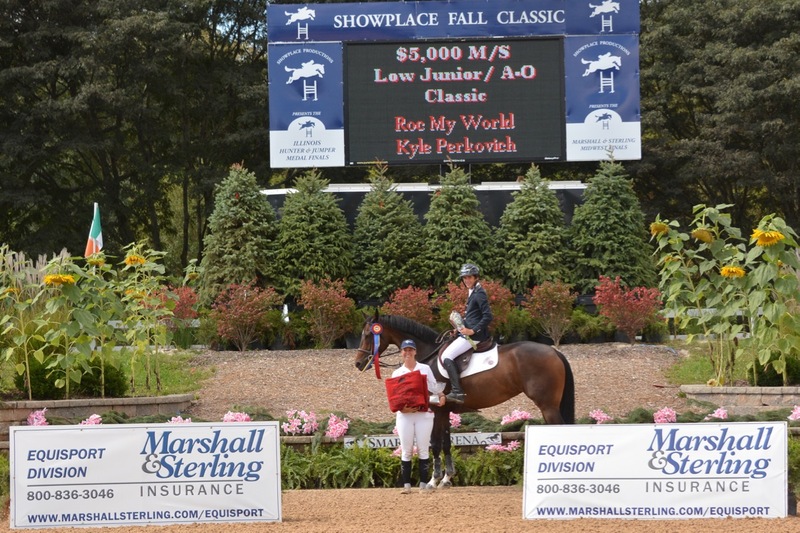 Kyle Perkovich and Roc My World received the Leading Horse and Rider Bonus of $10,000 from Showplace Productions. Perkovich also was the Leading Rider and received a CWD saddle. 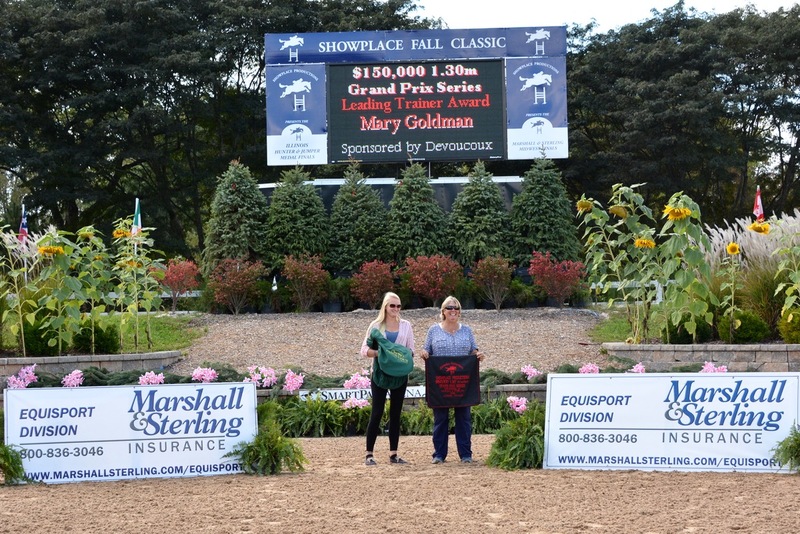 Perkovich’s trainer, Mary Goldman, took home the Leading Trainer award, a $5,000 gift voucher from Devoucoux. 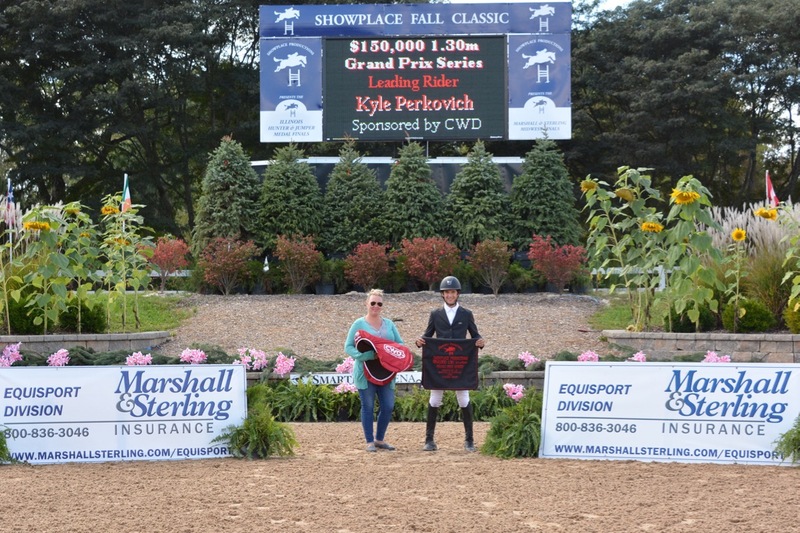 Kyle Perkovich earned a CWD saddle for Leading Rider. Photo Chicago Equestrian. Kyle Perkovich and Roc My World earned the Leading Horse & Rider Bonus in the Marshall & Sterling 1.30m Grand Prix Series. Photo Chicago Equestrian. Perkovich will head to Kentucky with the Goldman’s and Red Coat Farm next wee for more jumper competition. The busy day continued with a quick course change and on to the M&S Medal Finals. Riders showed their skills over a course with bending lines, combinations, rollbacks and straight lines to earn their first round score. The top four riders were invited back into the ring for additional testing. Winning the M&S Adult Medal Final for the second year in a row was Meredth Wegbreit from Barrington, Illinois. Wegbreit rides with Lauren Schone at Greystoke Farm. Second place winner, Kelsey Concklin on Kevin Babbington’s Castleforbes Vasco, also rides with Schone. Wegbreit and Concklin will show in the IHJA Adult Medal Finals on Sunday. Unlike Wegbreit, Concklin doesn’t know her horse as well; she is borrowing the sale horse from Schone so she could ride in the finals. Wegbreit also won the IHJA Adult Medal in 2015 so she’ll head into the second day with some experience under her belt but Concklin is a real competitor so it will be a class to watch. “I’m just going to try to be smooth and even tomorrow,” added Wegbreit. Adeline Cordin-Blitstein and Vince was third and Emily Yslas with McLovin made the final four. In the Sore No More Children’s Medal Finals, Britta Stoeckel was on top with a score of 78, followed by Delaney Hoffman with 72, Molly Canfield with 70 and Jaimee Delorge with a 66. The top four came back for some flat work as their test. After the line up it was Delaney Hoffman and Bravo taking the Championship with Molly Canfield and Penny Lane as the Reserve Champion. Stoeckel ended up in third with Delorge in fourth. 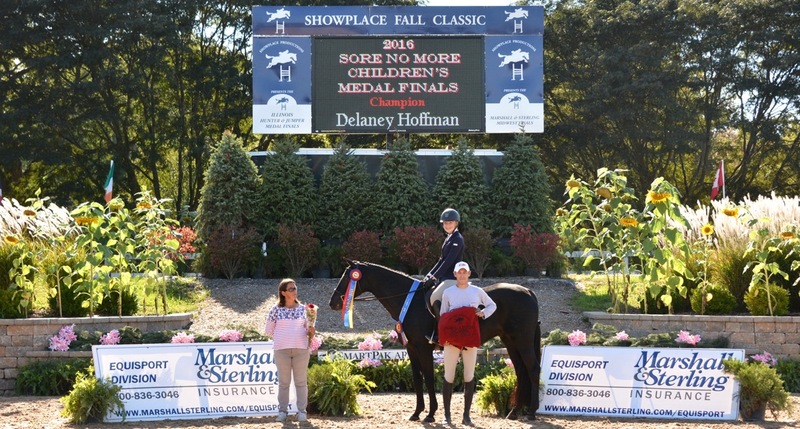 Delaney Hoffman with trainers Janet and Ryan Sassmannshousen. Photo Chicago Equestrian. Hoffman, 13, of South Elgin, Illinois, rides with Kinvarra Farm and leases Bravo from Stephanie Kraus. Canfield, also 13, rides with Lorrie Canady at Galway Farm in Long Grove, Illinois. 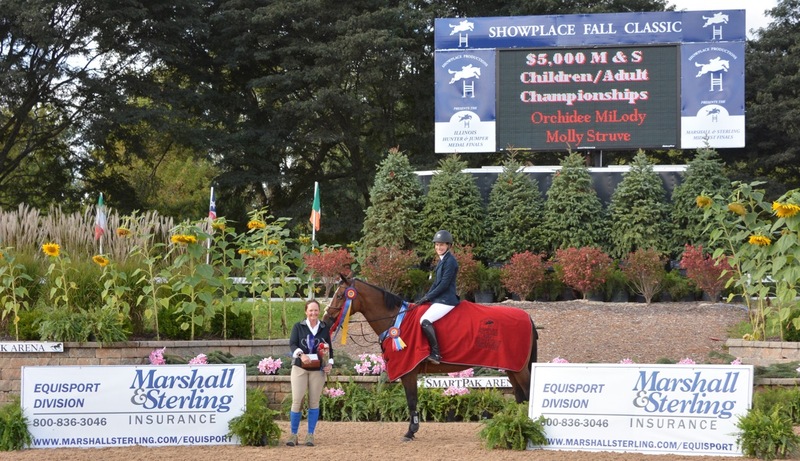 Molly Canfield was the Reserve Champion in the Sore No More Children's Medal Final. Photo Chicago Equestrian. “I was hoping it would be a jumping test because in my opinion the jumps are more fun but I was happy to flat because Penny is so simple,” said Canfield. Both Canfield and Hoffman will show in the IHJA Medal Finals as well. “I thought today was a really good warm up and Penny was really good so I’m excited for tomorrow,” added Canfield. “I also thought it was a great warm up for tomorrow because yesterday I was far from perfect,” laughed Hoffman. In the M&S Junior Medal Finals, Paige Matthies was the leader from beginning to end with a first round score of 85. Gia Gulino scored an 82, Ashley Flanagan received a 78.5 and Louisa Brackett earned a 78 to be in the top four. The junior riders had the most difficult test of the day which included cantering an oxer straight from the line up, a trot jump, a halt and a counter canter through a turn to the last jump. The four junior riders stepped up to the plate, displaying some well thought out executions. Matthies ended up on top for the Championship with the other riders also holding their first round spots with Gulino as Reserve Champion, Flanagan third and Brackett in fourth. Matthies rides with Melissa Hirt at Northern Pines Farm in Michigan. She will ride in the IHJA Medal finals then head to Kentucky for the ASPCA Maclay Regionals. Gulino was the 2015 winner of the M&S Junior Medal. She qualified for the ASPCA Maclay finals last year and will head to Kentucky next week to qualify again. Gulino rides with Tina Judge-Boyle at Judgement Farm and also spends time with top equitation trainer Don Stewart of Ocala, Florida. “Pat (Boyle) and Skip (Bailey) always have great courses for finals. There were so many lines for going forward and coming back or bending lines to stay out a stride or two, it was all very helpful and you can’t get this anywhere else,” said Gulino. Liberty Z is a new ride for Gulino so she plans on using tomorrow as another time to get to know him better before the regional competition. He’s a very different type of horse from her last equitation horse so she is just getting the feel for him. “I’m really lucky to have any horse to go to regionals with right now,” said Gulino with a smile of gratitude. Last but not least, Emma Lackey won the M&S Pony Medal Finals. Aidan Reilly-Madan was second, Erica O’Niel third with Avery Stein in fourth. Emma Lackey with trainer Scott Gentry. Photo Andrew Ryback Photography. Medal competition continues on Sunday with the highly anticipated IHJA “A” Medal Finals and the M&S Children’s and Adult Hunter Championships. The day will be another Showplace celebration with great hospitality and challenging competition. 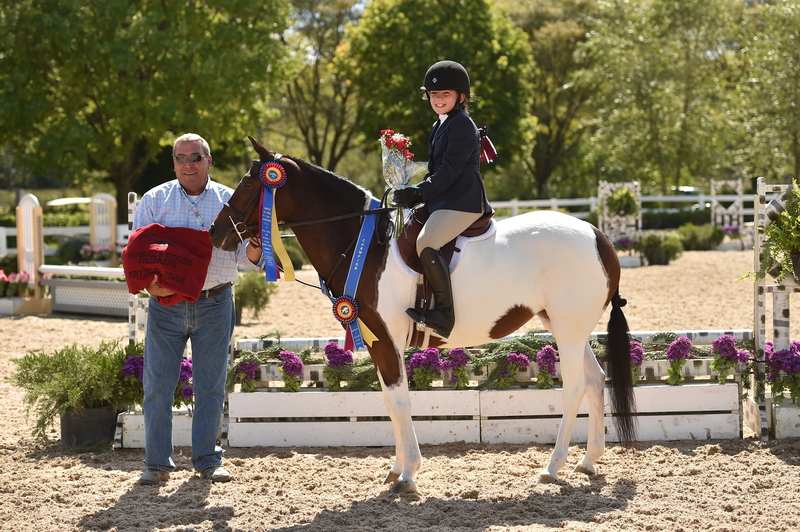 The Marshall & Sterling League was first designed to encourage and enhance the competition level of Children and Adult riders by providing the opportunity to qualify for a prestigious National Finals Competition. 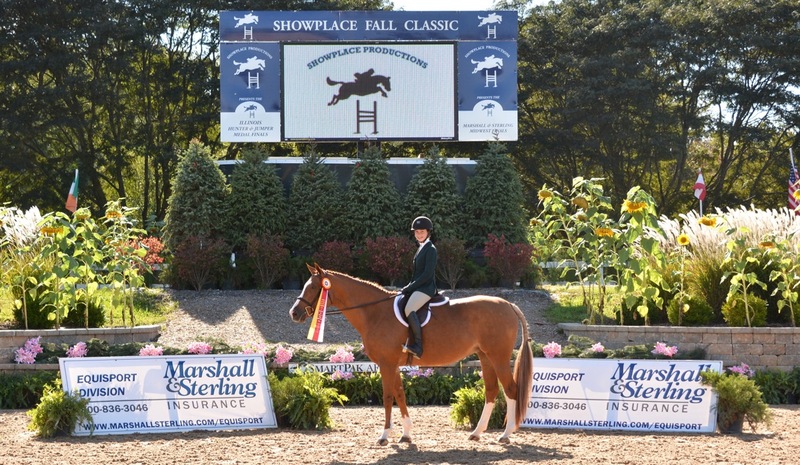 For over two decades, the Marshall & Sterling League has stayed at the forefront of hunter/jumper competition, having grown from 10 member shows and approximately 100 riders in 1991, to over 1,300 horse shows and more than 2,300 riders today. Visit their website at www.marshallsterling.com. Photos are copyright protected and may only to be used in relation to this release.